Suddy’s Excavating Service has worked with numerous contractors, developers, industrial facilities, and organizations throughout the Greater New Orleans area. Murphy Oil Refinery Tank Foundation Const. Racetrac Gas Station – Williams Blvd. & Airline Hwy Kenner, La. Victory Retail Center – Veterans Blvd. Riverbirch Landfill Clearing, Levee, & Pond Work (120 acres) – Waggaman, La. 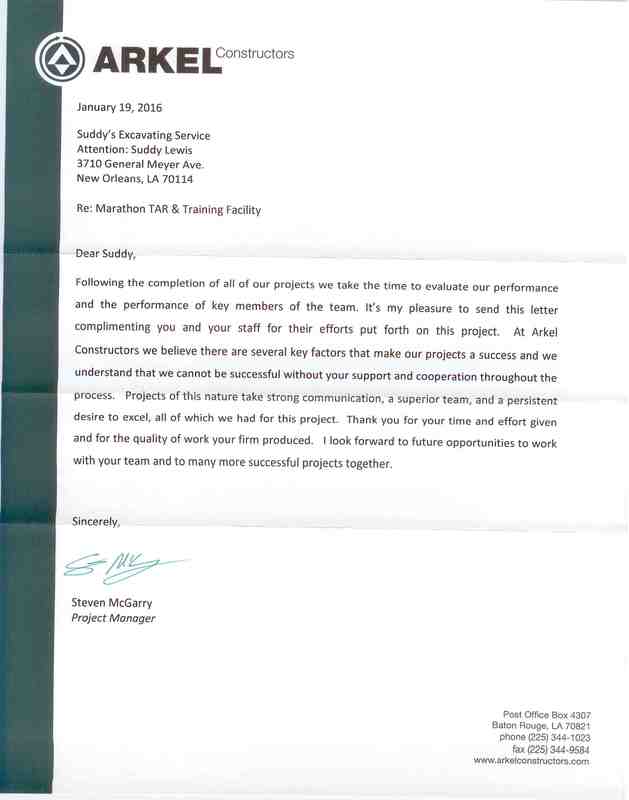 “Suddy has worked with our firm on many projects. He is a professional sub-contractor that is reliable and has excellent work ethics. It is a pleasure doing business with Suddy and his firm.” ~ Dreama Murphy, Corporate Secretary at Shamrock Const. Co., Inc.